K-Lite Codec Pack is a collection of VFW/ACM codecs, DirectShow filters and tools. Codecs and DirectShow filters are needed for encoding and decoding (playing) audio and video formats. The K-Lite Codec Pack is designed as a user-friendly solution for playing all your audio and movie files. With the K-Lite Codec Pack you should be able to play all the popular audio and video formats and even several less common formats. There are four versions of the K-Lite Codec Pack: Basic, Standard, Full and Corporate. • Basic contains only the most essential things. It contains everything you need to be able to play the two most popular and widespread formats: DivX and XviD. With this you should be able to play DVDrips and TVrips. • Standard contains everything you need to play all the commonly used formats. This package should be enough for the average user. • Full supports even more audio and video formats. It also has encoding support for various formats. This package is for power users and people who do video editing/encoding. • Corporate Edition is a special version for use in a corporate environment. It is similar to the Full version, minus a few items, but almost just as powerful. It has a strong focus on open-source software. 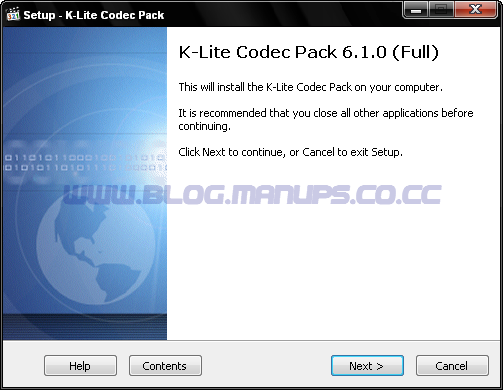 The K-Lite Codec Pack is compatible with Windows 2000, XP, 2003, Vista, and Seven.